Since I've been making Youtube videos recently, it's been a while since I wrote an article. A lot has been going on over the past week regarding the events in Charlottesville, Virginia last weekend. The so-called President of the United States has effectively become an apologist for neo-Nazis and the Ku Klux Klan. Making this essentially a white supremacist administration. However, while many might think of this as being a low point for this administration, 67% of Republicans approve of Donald Trump's reaction to Charlottesville. For all intents and purposes, Republicans follow Trump like he is their cult leader now. Trump once said he could kill a person in broad daylight and his supporters wouldn't abandon him. Many Trumpsters are on board with whatever he decides to do, even if that includes apologizing for some of the worst elements in American society. A deeper debate has now taken place as a response to the Charlottesville terrorist attack. Many have begun to call for the immediate removal of Confederate monuments around the nation. America, in its historic appeal to white supremacy, has allowed hundreds of monuments to be erected in celebration for the traitors who fought a Civil War against this country. 718 monuments or statues are erected all over America. This isn't the extent of the nation's celebratory nature of Confederate memorializing. There are a number of schools and even military bases named after Confederates as well. Then there are bridges, highways, parks, and flags. A number of local and state officials have taken matters into their own hands. The Roger B. Taney statue was removed from in front of the State Capitol in Maryland at the request of Republican Governor Larry Hogan. Taney is most known for his role in the Dred Scott decision that maintained that Black people were not Humans. Why the hell would black people want to see that every day? The side we fought on won the war, so let's not begin caping for Confederate monuments. The Mayor of Baltimore, Catherine Pugh, had 4 Confederate monuments removed under the cover of darkness - which was smart on her part. Governor Hogan did the same thing when removing the Taney statue. There are many more proposals in various states to remove the images of traitors and enslavers from public land. This is not erasing history, it is erasing a terrible legacy. A legacy we shouldn't want on a glorious display as if it didn't destroy the lives of tens of millions of people. 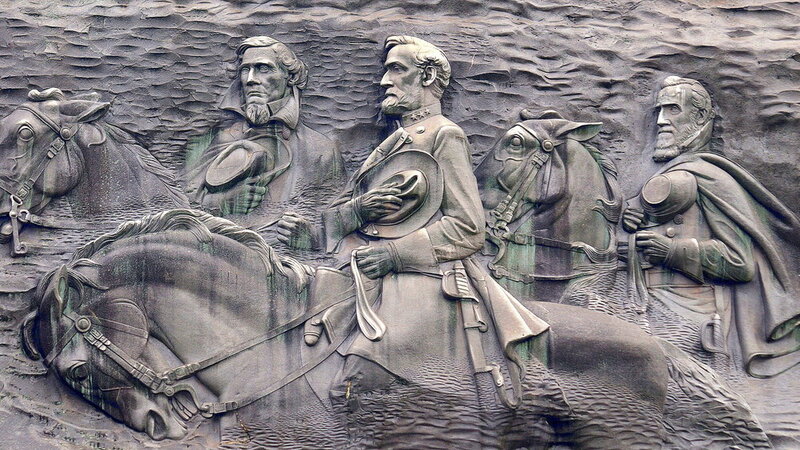 I also want to say that I support the initiative of Stacy Abrams who has called for the removal of the Confederate stone-carved monument in Stone Mountain, GA. It is the largest monument of its kind and needs to go as well. Confederates attempted to overthrow the American government in a failed effort to maintain slavery. While the Union certainly was a problematic force in its own right and really only armed Blacks because they were losing the war, we should be fortunate that the Union won and not the Confederacy. I think we can all agree on that at the very least. All of the pro-Confederate imagery of America needs to be erased. If people want to learn about the past, they can go to Google or read a book. Watching films and documentaries are also effective ways of learning the past. So it's not the past being erased, that cannot be done. It is the celebration of white supremacy that must be erased. From sea to shining sea. For those that disagree with me, I ask you this. What is it that you can learn from a statue that cannot be learned from a book? Are you defending the statue as a cultural history lesson or are you simply reinforcing the legacy of enslavement? Because if it's just about history and the past for you, then surely you can get a better source than a statue. Most of these monuments were built to intimidate and terrorize black Americans post-Reconstruction. They were meant to teach white supremacist values to a new generation of white Americans and to romanticize the Confederacy. How in a country supposedly built on the concept of freedom and justice can monuments venerating slavery be allowed to continue to stand in public? Every last Confederate monument must go.